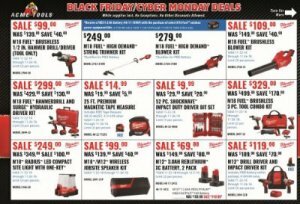 I got a copy of the 2018 ACME Tools Black Friday Ad Scan (see below), and they are offering a great selection of deals from many different brands. Many of the deals have already started, but some won't start until tomorrow. Be sure to check the dates in the Ad. They are offering brand deals like 15% off Jet tools and 10% off Powermatic tools, they also have some specific deals on popular cordless combo kits from the major brands, including DeWalt, Makita, and Milwaukee. Like last year, they have instant rebates on Honda generators of $50 or $100 off select models. To see all of the ACME Tools Black Friday and Cyber Monday Deals, check out the Ad scan below. You can click on the products to be taken directly to that page on the ACME Tool website.